Santa and Mrs. Claus greet a friend at Al Johnson’s. The Ridges in Baileys Harbor will once again hold its annual Natural Christmas event, 3-6 pm. Spend a few hours this holiday season surrounded by the natural beauty of The Ridges Sanctuary. Stroll down the softly lit Hidden Brook Boardwalk, enjoy an outdoor campfire, and listen to music in the beautifully decorated Kaye Cabin. Sip warm cider and eat delicious cookies while listening to live holiday music. Shop The Nature Store for nature-themed stocking stuffers, housewares and clothing. Natural Christmas also offers a wreath making workshop ($20 per wreath) and free holiday crafts for kids and adults. Guided hikes and tours of the Range Light will be available throughout the event. The event will be held at The Ridges Cabins, 8288 Hwy Q. Admission is free, but donations are appreciated. For more information visit RidgesSanctuary.org or call 920.839.2802. Bundle up and join the Gibraltar Historical Association for its annual holiday tree lighting and caroling celebration. Festivities begin at 5 pm at Noble Square, on the corner of Main Street and Highway 42 in Fish Creek. Along with the tree lighting, the event offers traditional songs for all to sing, with the Gibraltar Schools’ choirs leading the singing. Following the ceremony and caroling is a social at Blue Horse Café with cookies and hot cocoa to warm up your heart and visit with the community. For more information visit historicnoble.org. Whether you’re in northern or southern Door County this weekend, Santa will have breakfast with kids across the county. Head to either Sister Bay or Brussels to meet him. Santa will visit the Brussels Community Center/Town Hall for breakfast from 8 to 10:30 am. Breakfast includes all-you-can-eat waffles, pancakes and ham. Kids can meet and take pictures with Santa and complete free craft activities until 10 am. The cost is $6 for ages 10 and older and $3 for ages 9 and younger. Families can save $1 off the total with a donation of canned goods. Brussels Community Center is located at 1366 Junction Road. 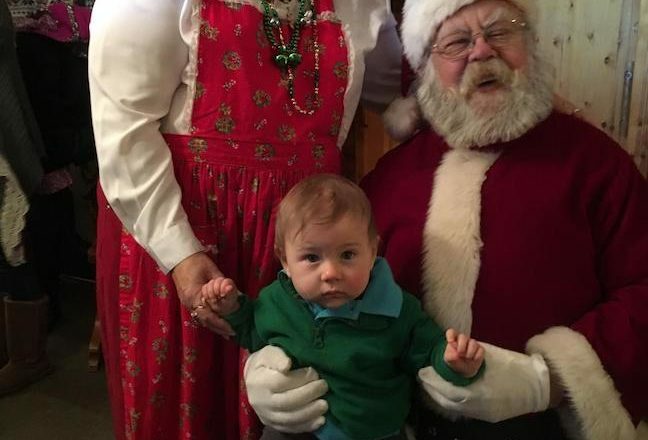 From 9 to 11 am, Santa will be at Al Johnson’s Swedish Restaurant in Sister Bay. Kids will be able to meet with Santa and Mrs. Claus and will also receive a small gift.